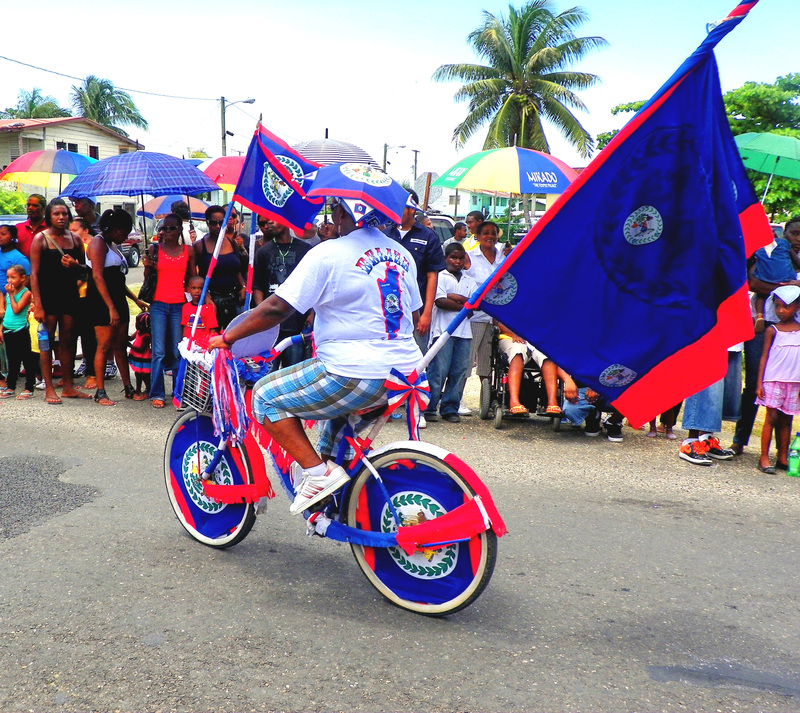 Belize is a fairly young nation, having gained independence only in 1981. Even though the country is young, some of the symbols that represent the nation were developed even before Belize became a crown colony. The symbols represent a unified nation that the early nationalists carved out of various interest groups in the 1950s. This was the genius of early nationalists – they unified a highly stratified and divided society. They national symbols portray this goal as well as a respect for the natural environment. Belize’s flag was designed by a committee appointed in 1981. The objective was to create an emblem which would represent a unified country. The flag is comprised of three rectangular bands and a central white circle containing the coat of arms. The top and bottom bands are red in color while the central band is royal blue. 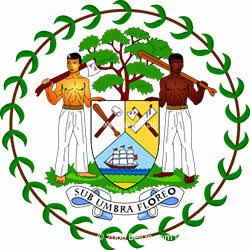 The white inner circle contains the coat of arms of Belize. This coat of arms contains two wood cutters holding a beating axe and a paddle respectively. These wood cutters are supporting a shield divided into three sections. The two upper sections contain a paddle and a squaring axe in the right section and a saw and a beating axe in the left section. At the bottom is a ship in full sail. Behind the shield is a mahogany tree. Below the coat of arms is a banner bearing the words Sub Umbra Floreo (Under the shade we flourish). Encircling the coat of arms are fifty olive leaves which signify 1950, the start of the nationalist movement in Belize. The fifty olive leaves, as in the time of the Greeks, signify victory. The Belizean coat of arms. 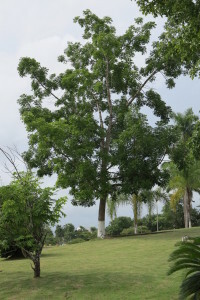 the national tree of Belize. Mahogany (Swietenia macrophylla) is a deciduous (See Glossary) broadleaf species with large compound leaves. Each compound leaf blade is about 40-45 cm long and 23-25 cm wide. Each leaflet can vary between 14-20 cm long and 5-7 cm wide. These leaves turn from green to brown in May which makes the trees visible from miles away. The tree is deciduous with the leaves falling off between May and June. A cylindrical stem is formed by the trunk of the mahogany tree. In natural forests, the crown of the tree forms a semicircle starting at the point where the trunk separates into branches. When grown in open areas, juvenile mahogany trees take a more rectangular shape before the forming of a crown. The mahogany tree has been harvested for export to Britain from the 1770s. The wood is an attractive tan color and is easy to work and is long lasting. 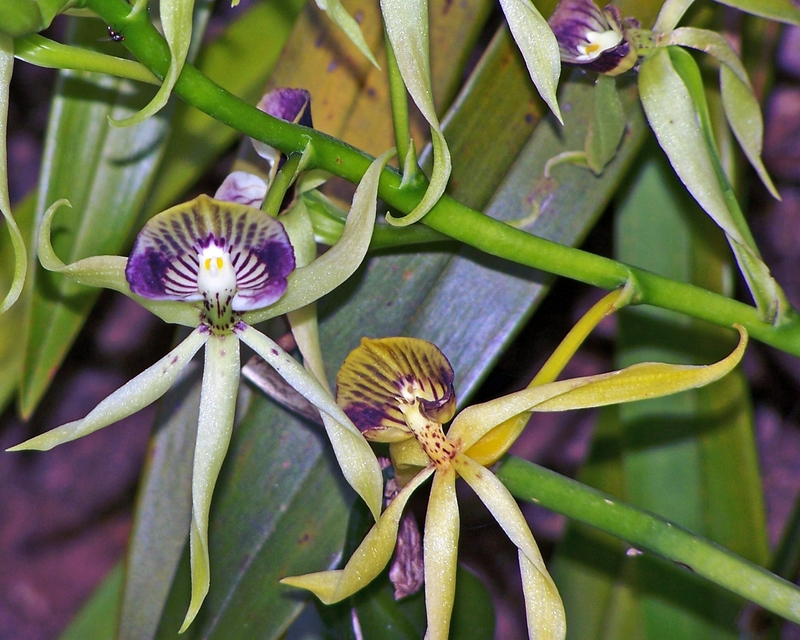 Belize’s national flower is the Black Orchid (Encyclia cochleata). This is also known as the cockle shell orchid or the clam shell orchid. This orchid grows on the truck or limbs of large trees and is characterized as an epiphyte. the national flower of Belize. 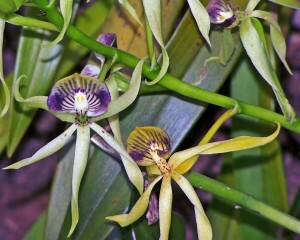 The petals and the sepals are light green in color but the lip or labellum is light green and purple. Because of the dark color of the labellum, this orchid is called the Black Orchid. The lip forms a hood over the reproductive parts of the flower. Black orchids are found in Central America, The West Indies, Colombia, Venezuela and southern Florida where they are endangered. This species is well liked for its beauty and is easy to grow. Black orchids flower practically for the entire year. Baird’s tapir (Tapirus bairdii) was designated the national animal of Belize in 1981. Called mountain cows in the Creole language and danto in Spanish, these 240-400 kg mammals reside in healthy forests where they form trails in areas which they frequently travel. In addition to habitats in forests, tapirs can frequently be seen in rivers or lakes where they visit on hot days. the national animal of Belize. One of the noticeable features of the tapir is its prehensile nose, which functions like a shortened version of an elephant’s trunk. This organ is highly effective in locating and taking advantage of opportunities to feed. 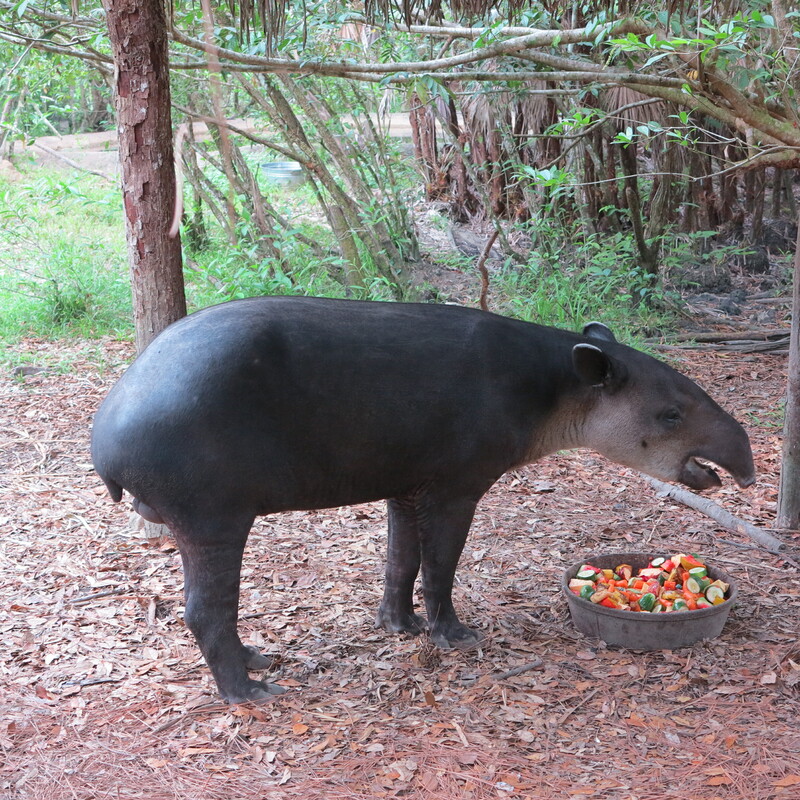 The main diet of tapirs includes plant matter such as twigs, flowers, sedges, grasses and fallen fruit. The tapir eats some plants during certain times of the year but avoids them at other periods in the year. Prickles and biting ants hardly deter these animals from consuming most plants. Baird’s tapirs spend most of their waking hours foraging. They forage in one of three patterns: 1) feed on several species in a small area, 2) feed only on a single species within a small area, or 3) grab and eat various plants while moving. Tapirs prefer plant species of medium to tall height and find agricultural crops such as corn and root crops like yams and coco highly attractive. As a consequence, milpa farmers are often raided by the national animal. In such cases, it is known that it is illegal to kill or harm the national animal. 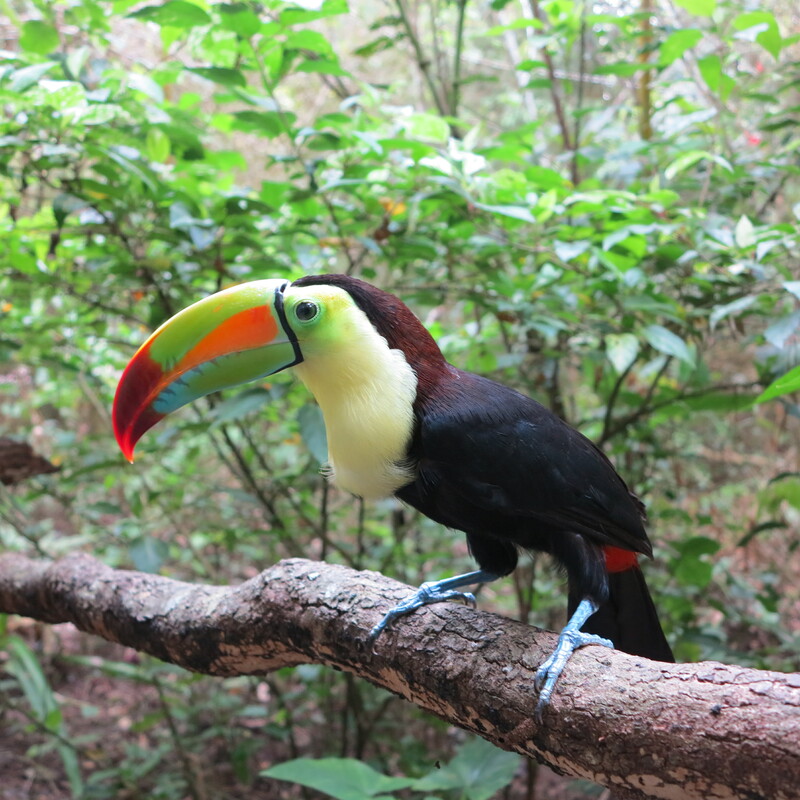 Belize’s national bird is the Keel Billed Toucan (Ramphastos sulfuratus). This large toucan is 17-22 inches in length with white, yellow, red and black on the body and bright yellow on the cheeks and chest. The bill is yellow green, bright orange and dull red. 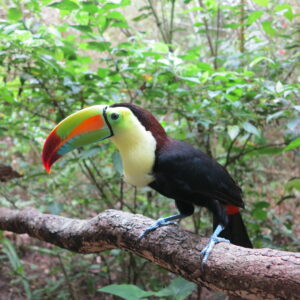 The Keel Billed Toucan is a social and friendly bird. The diet consists mostly of fruits but includes insects and spiders. Food is held in tip of the bill and thrown backward into the throat with a gentle backward toss of the head. the Keel Billed Toucan (Ramphastos sulfuratus). Nesting occurs between March and June. Nesting chambers are formed from decaying knotholes of tall branchless trees. Three or four eggs are incubated by both parents. Newly hatched chicks are naked with tightly closed eyes.